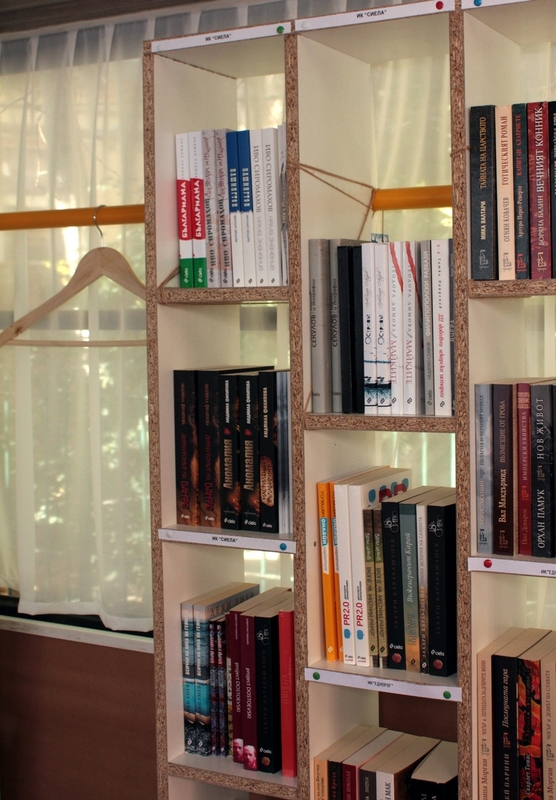 Although the chitalishta (literally, “reading spaces” in Bulgarian) have played a crucial role since the mid-nineteenth century in preserving and developing Bulgarian culture, these civic centres, which function simultaneously as libraries, theatres and educational spaces have not always been favourably regarded by the powers-that-be. In the years of Ottoman rule, they were the cradle of the Bulgarian National Revival, a cultural movement which, encouraging the circulation of works by authors like the monk Paìsiy Hilendàrski (Saint Paisius of Hilendar), contributed towards the rediscovery of Bulgaria’s own history as a galvanising factor in producing a literary self-awareness that would end up leading to the country’s emancipation. During the communist era a century later, the chitalishta outlived competition in the form of “people’s houses” ─which were much better financed by the state─ thanks to their widespread deep-rootedness and reputation as bastions of free culture. The chitalishta are much less present today and increasingly irrelevant, in great part because of lack of support from an administration that continues to ignore them. 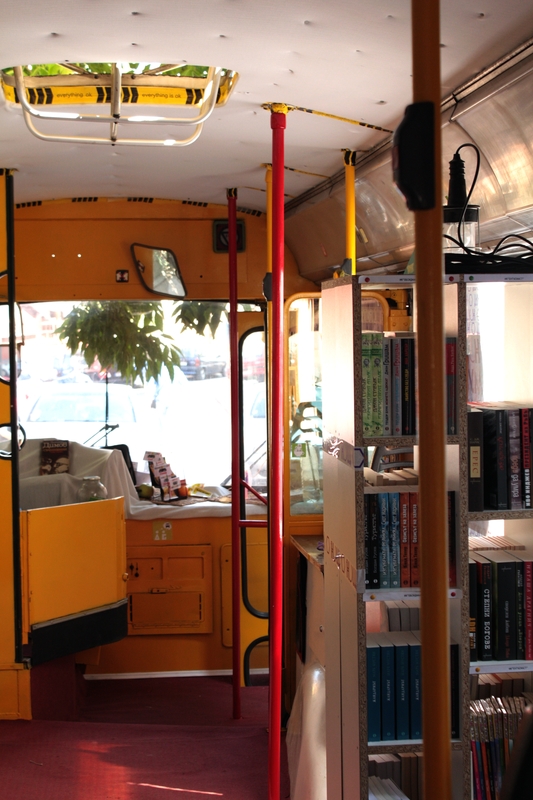 Now, the outstanding feature of the network of reading spaces is the precariousness of its existence, a reality testified to by the fact that only 6% of these facilities can offer Internet connection to their users. Nonetheless, their function is as necessary as it ever was since, while Bulgaria has traditionally enjoyed high educational standards, the number of school dropouts has tripled since the beginning of this century. Moreover, in the European Union, it is the member state with the lowest number of regular readers. However, if an initiative to speak out against and attempt to remedy this trend were to appear, it had to be in Plovdiv, the second most populated city in Bulgaria and one of the country’s main literary centres. It came about precisely in Otets Paisiy Street, named after Paìsiy Hilendàrski, just opposite the power station that supplies electricity to the municipal trolley bus system, the point from whence they first began to circulate in 1956. The site, adjoining the city’s shopping area and the zone most visited by tourists, is now losing what was for many years its characteristic bohemian feel or sense that it was steeped in alternative culture. Witness to this is the empty space left by the closing of a famous bookshop, which was also named after the historian monk. The initiative was fruit of a competition for which entries were called in 2011 by the Open Arts Foundation, a non-profit-making NGO which, among other events, promotes the Plovdiv Night of Museums and Galleries every spring. Under the auspices of this festival, the winning project consisted of a proposal for a shared reading space. With a budget of only 300 euros it sought to revive cultural life in the neighbourhood. Rather than replacing the conventional library, the idea was to complement it and expand its functions by taking advantage of the visibility of the site and thus challenging passersby to take up the habit of reading. 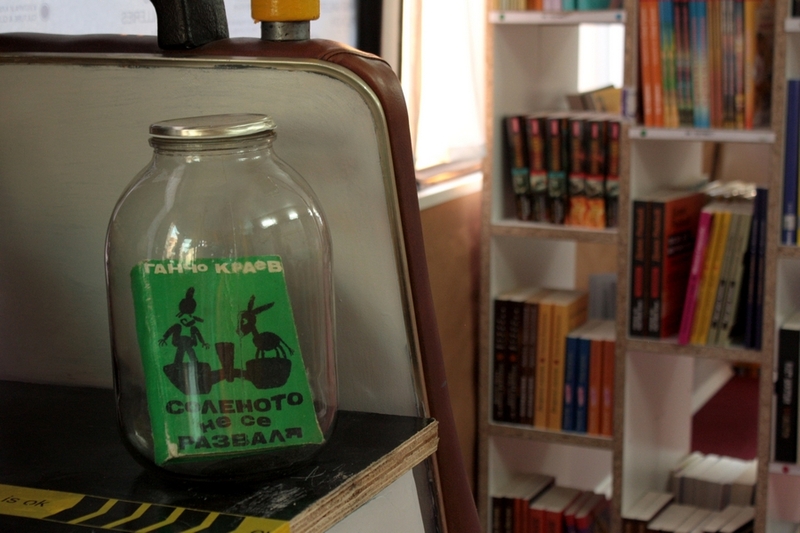 Adopting a provocative, alternative stance that strove to highlight the urgent need for up-to-date libraries, the project was aimed at young people in particular and, in general, at making people aware of the problem of the low proportion of readers among the citizens. The initiative also aimed to go beyond the festival itself by encouraging its beneficiaries to keep reading after the Night was over. 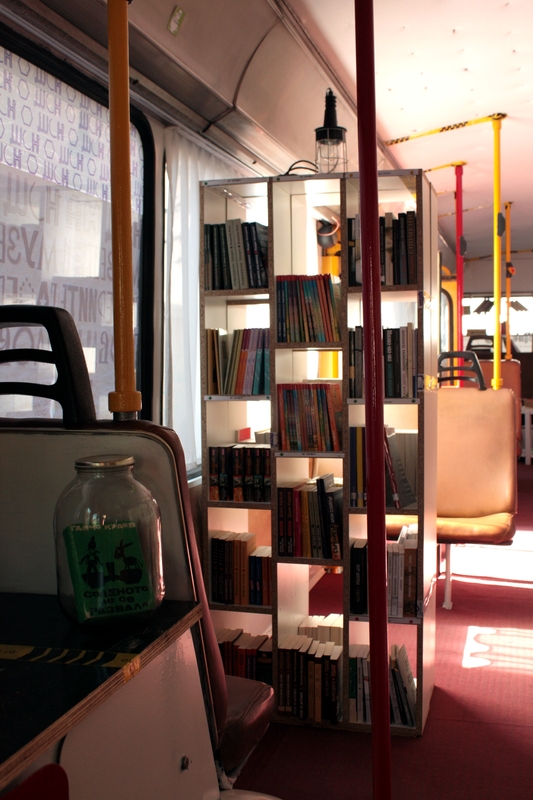 The idea was to create a mobile library inside a disused trolley bus. It took two months to obtain the vehicle from the municipal bus depot, where the only future that awaited it was being taken apart. 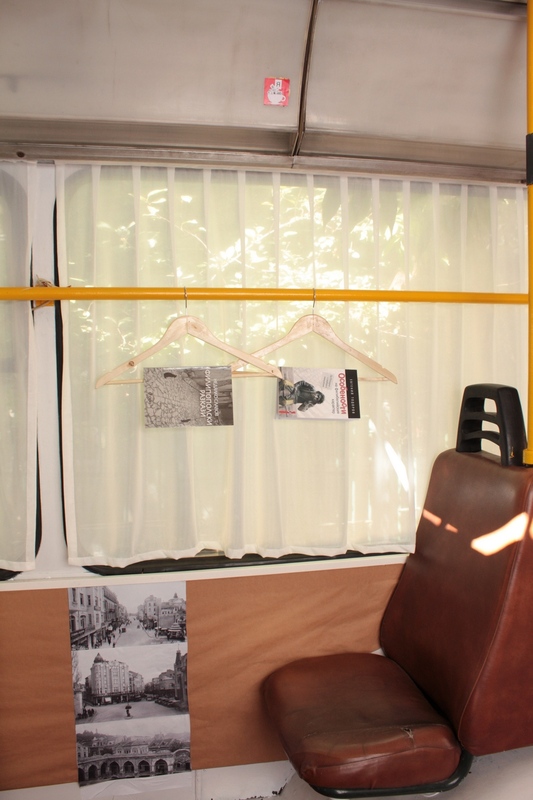 Once the red tape had been dealt with by not very official means, the trolley bus was installed in Otets Paisiy Street where it was transformed thanks to the voluntary efforts of some twenty people who worked on it day and night for two weeks. A good number of the seats were removed to provide space for three study tables, several reading corners and eight bookshelves housing some six hundred volumes. 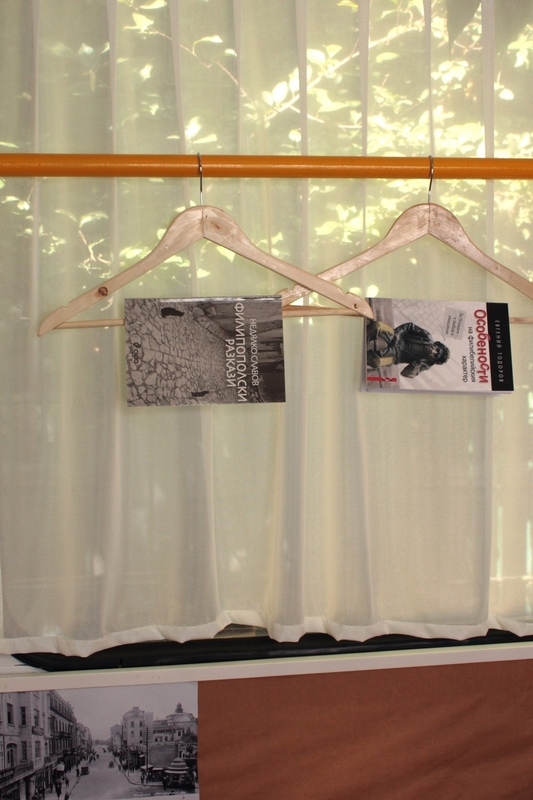 The collection was made up of a selection of Bulgarian and foreign writers. 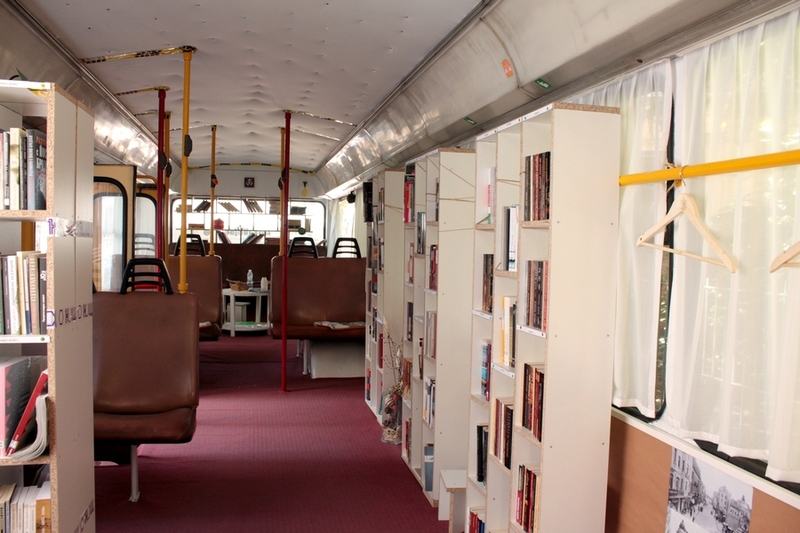 In the back section of the bus, an area was reserved for young children and used for playing, storytelling and activities with colouring books. The bus was equipped with lighting, Internet and piped music. 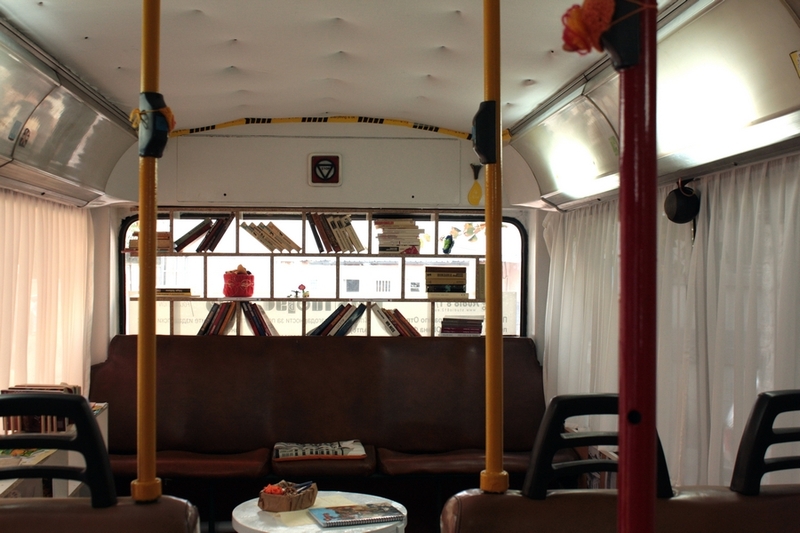 The floor inside was renovated and the doors were covered with historic photographs of the city, while the outside of the trolley bus was painted in bright colours and decorated with designs conveying festive, suggestive messages. 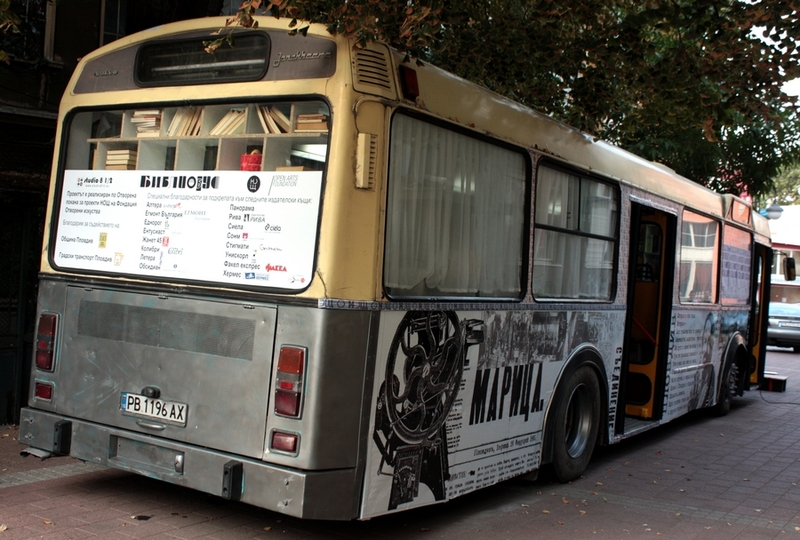 As planned, the mobile library endured beyond Plovdiv’s Night of Museums and Galleries. Two months after it was opened, however, the City Council, giving no warning of its intentions, removed the vehicle one night and returned it to the depot. 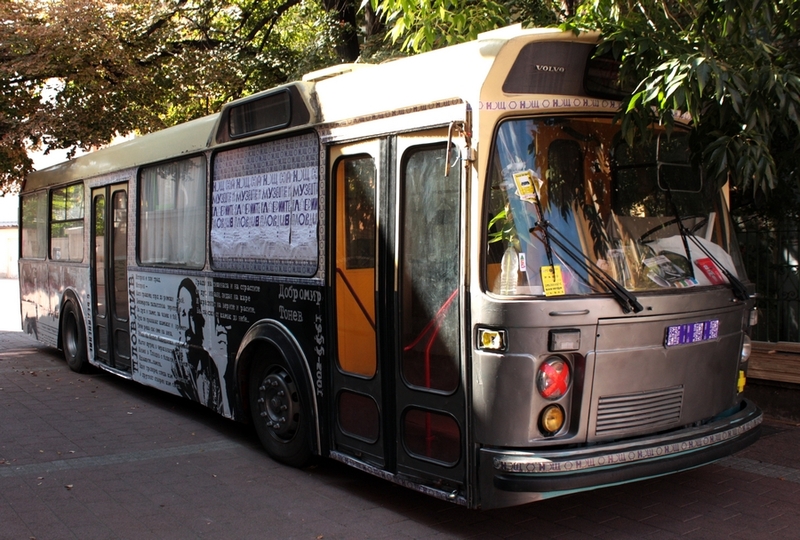 Paradoxically, this insensitive move by the authorities only provided the finishing touch in the surprising trolley bus’s capacity to link up with the old tradition of the Bulgarian chitalishta. 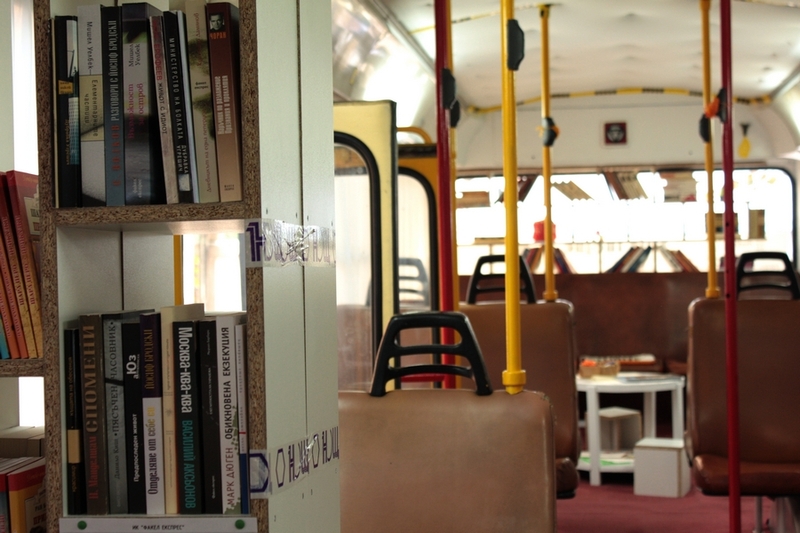 Like them, in the awareness that a free, accessible and critical culture is an indispensable citizens’ instrument for democracy, this shared reading space, open to everyone, free of charge and independent of political and economic power was able to connect with the people. 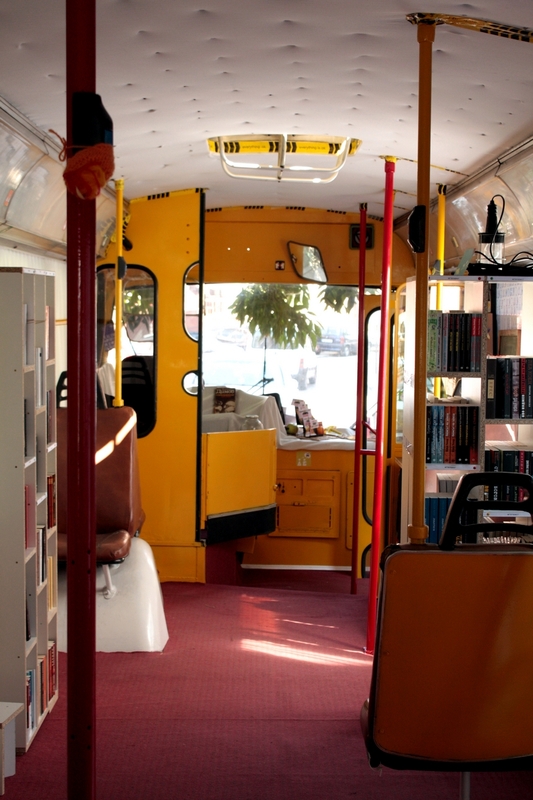 Intensely used by local residents, students and workers who sought lunchtime refuge within it, the trolley-bus library was so successful that it was invited to visit other places. While studying the viability of these proposals, its promoters have applied to the City Council for permission to install it again next spring, once again in the heart of a neighbourhood that was able to relive the freedom of alternative, bohemian culture for too short a time.